Quilted jacket by MYBC. Modern look in shimmering micro­fibre. 100% polyester. Large, adjustable collar. Wide quilting. Concealed zip fastening and press stud placket. 2 flap pockets with press studs. Additional zipped pockets. 1 inner zipped pocket. The hem width can be adjusted thanks to an outer drawstring with stoppers. Length approx. 28ins. Lining and padding in 100% polyester. 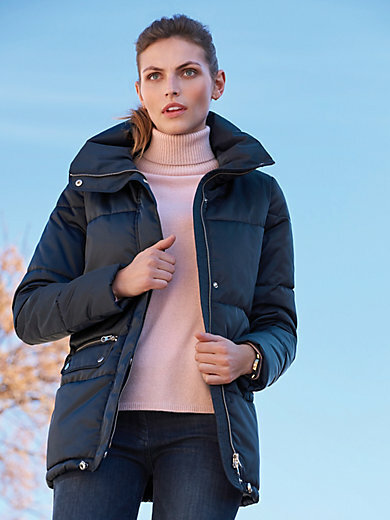 The quilted jacket is machine washable.